In 3-quart saucepan or large pot, whisk together butter, brown sugar, and ice cream over medium-high heat until melted. Add the water; cook and stir mixture until steaming. 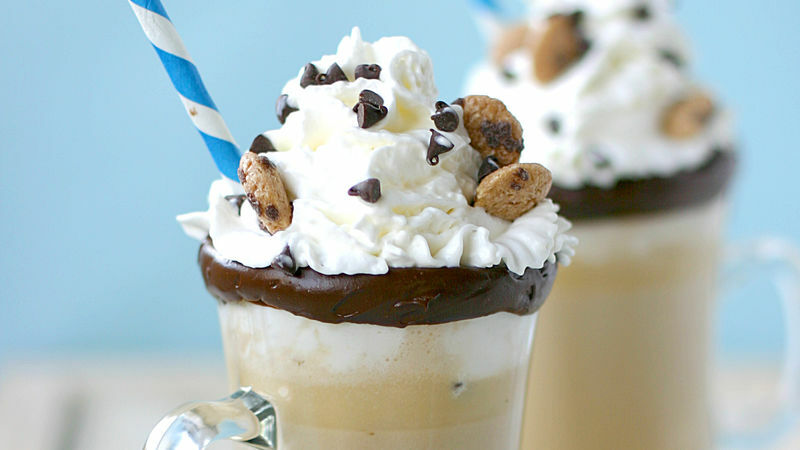 Serve in mugs, topped with whipped cream, mini chocolate chips, and cookie crisp cereal. This cocoa recipe is so versatile! Just swap out the cookie dough ice cream for one of the flavors below, for a fun twist on classic hot cocoa. Use peanut butter ice cream, instead of cookie dough ice cream. Garnish with Reese’s Puffs® Cereal. Use chocolate Ice Cream, instead of cookie dough ice cream, in the recipe. Garnish with Cocoa Puffs® Cereal. Use vanilla bean ice cream, instead of cookie dough ice cream, in the recipe. Garnish with Lucky Charms® cereal. Use dulce de leche ice cream, instead of cookie dough ice cream, in the recipe. Garnish with Cinnamon Toast Crunch® Cereal.